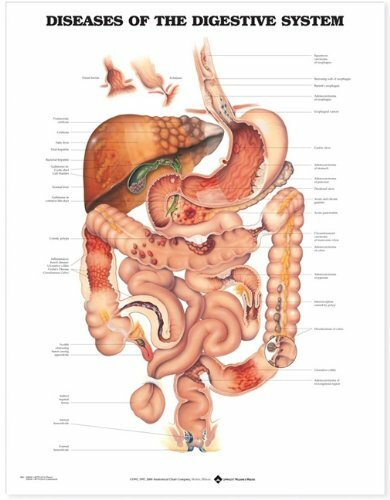 The Diseases of the Digestive System chart Illustrates a wide variety of diseases using a central image of the digestive system. Details of the disease or condition are illustrated on the organ they affect. shows the following: Cancers of the esophagus, Barrett's esophagus, Esophageal varices, Cirrhosis, Fatty liver, Hepatitis (viral and bacterial), normal liver, Gallstones, Gastric and duodenal ulcers, Adenocar, Pancreatitis, Cancers of the colon, Colonic polyps, Diverticulosis of the colon, Ulcerative colitis, Inflammatory Bowel Disease, Crohn's disease, Hernia (hiatal and inguinal), Hemorrhoids (internal and external), obstruction of the appendix.